Why might you need implants? Missing teeth should be replaced as soon as possible as this can lead to serious problems in the future: jawbone recession, instability in neighbouring teeth, problems with digestion due to improper chewing and changes in speaking (e.g. lisping). If you wish to prevent these problems then you should read this blog. Dental implants are the most effective solution for those who are seeking long-term solutions for missing teeth. It is possible to replace one, several or a whole set of teeth with implants. Click to view more before and after images! Dental implants act as an artificial root which, having been installed into the jaw bone, fuse together with the bone and are then loaded with crowns or bridges to provide firm, stable, permanent teeth. Amongst several tooth replacement methods, dental implants are the most similar in nature to natural teeth. The titanium root in the bone replaces the natural tooth root while the crown replaces the natural tooth crown. With the help of implants speaking, smiling and chewing become natural once again and provide an excellent confidence boost. Generally speaking, dental implants are made from bio-materials (most commonly from pure, unalloyed titanium) that the human body can receive and accept without any known allergic reactions. The implantologists is working with us only use quality materials and technology that renders it possible to create crowns and bridges that are almost identical to natural teeth. The artificial root is fixed in the jawbone, so implantologists need to examine its current density and structure in order to choose the best implant type possible. If you have sufficient bone for implants the implantologist will choose conventional implants. 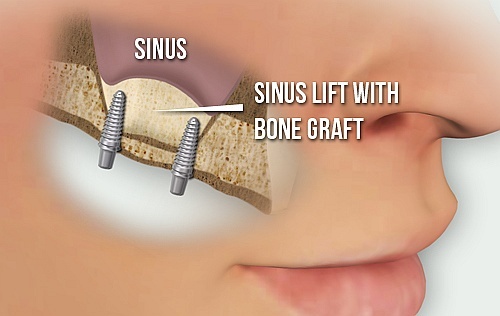 In this case there is no need to strengthen the bone in advance, so implants can be inserted immediately. Following treatment 3-6 months are required for the bone and implants to fuse properly (in dentistry this process is called osseointegration). If there is only slight bone recession but insufficient bone to provide a stable foundation for the implants, the bone is augmented with artificial bone. Once the two have fused together the implantologist can insert the implants, which will establish a stable connection with the bone thereafterh. In the past, these patients were refused to receive implants and had to wear dentures instead. Fortunately, today there exist revolutionary types of implants (the so-called Bi-cortical implants), with which bone replacement can be avoided and is is possible to insert implants in the the badly receded bone too. Thanks to this, 90% of the patients who were refused to receive implants can receive them now. You can read more about how the Bi-cortical system works here. In order to determine what the current situation of your bone is, we need an OPG x-ray. Not only the bone structure can be seen on this x-ray but inflammations, cysts, the state of the tooth roots and the hiding wisdom teeth are also visible. Choose the best solution for you! The implantologists working with us choose the best solution for you among many options. As mentioned above, the implant they use depends on the health of the teeth and the parodontium so a consultation is very important beforehand. The patient wishes to have implants. During the consultation it turned out that the patient has a good bone structure and there is no need for a bone graft (or sinus lift). The implantologist will use conventional implants. As the dentist conducts the treatment under local anaesthesia the patient does not feel any pain during the treatment. The dentist then opens the gum where the tooth loss occurred making the bone available for implantation. The next step is determining the place, length and direction of the implant with a special drill. After that the dentist makes a hole in the bone that suits the implant perfectly. The next steps are inserting the implant, closing it with a so-called healing screw and stitching the gum. After the treatment a healing period of 3-6 months starts during which the natural bone has a stable connection with the implant. In dentistry it is called osseointegration. After this healing time the patient goes back to the clinic and the dentist opens the gum again, removes the healing screw and places an abutment on the implant. The role of the abutment is connecting the implant with the crown. Then comes the impression of the abutment that is taken by the dentist. Based on this impression the dental lab creates the crown with the latest equipment and materials to make the crown look almost the same as the natural tooth. After the crown is ready (about 3-5 days) the implantologists fits it to the abutment and check whether the bite is proper on that area. Based on this - if it is needed - the dental technicians can still make some changes. In the end, the implantologist informs the patient about what to pay attention to regarding the right care of the implant. Implantation does not end at the clinic. A thorough cleaning and care is very important as the life expectancy of the implants are very much affected by the dental hygiene you maintain and your general health. The cause of the problem has to be considered. If for example parodontitis developed due to improper dental care and the gum and bone receded which led to tooth loss it is important to pay more attention to dental hygiene in the future. Cleaning the implants is not much different than cleaning the natural teeth. 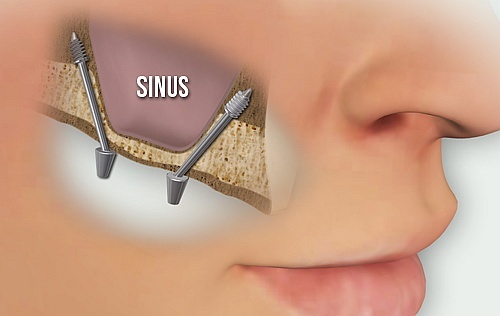 There is an area that is very important to clean which is the area where the gum and the implant connects. If you do not clean it properly it can lead to infection, inflammation. This can lead to losing the implant. When is the implantation successful? Generally speaking, implantation is successful if you do not feel pain or discomfort, the implant is stable and does not move, there is no inflammation or cyst around the implant and the OPG x-ray take after the treatment does not show any bone recession on that area. You will be required to attend check-ups regularly but if experience any problems do not wait until the check-up, contact your dentist as soon as possible. Would you like to know the solution to having fixed and permanent teeth? If you would, you are in the right place now! So far, dental implants are the most effective solutions for those who are seeking long-term solutions for replacing their missing teeth. The implant supported crowns or bridges are not just beautiful and natural-looking but they also stay in place in every situation so you can forget the embarrassing situations when dentures slip out while eating, laughing or speaking. Send us your OPG x-ray now or attend a dental consultation in London! As every case is different, in order to find the most suitable option for your dental problem we need your OPG x-ray. Based on this our implant specialists drawing upon the range of available implant systems will provide you with the solution best suited to you. You can send us your OPG x-ray and some notes on your dental problems by email (info@tibordental.com).